We are looking for people to drive the church bus to Cornwall Manor to pick up the seniors for church on Sundays and for special events. No CDL license necessary. This is a fun and very appreciated service of the church but is not a big time commitment. 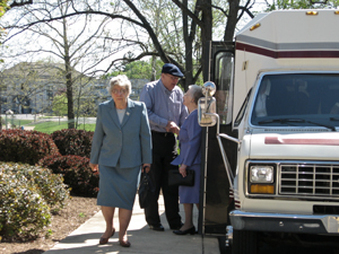 At 10:00 AM on Sundays the bus picks up the seniors at two stops and takes them back between 11:30-12:00 noon. New drivers will ride with another driver to learn the route. Drivers are scheduled to drive each Sunday for a month. Driving duty is dependant on the number of people available but at the present time drivers are scheduled about every 4 months. Special event drivers are determined at the time of need. If you are interested, contact Bob Doll at 717-273-8013.